Epidemiological threats can also originate outside of the U.S. 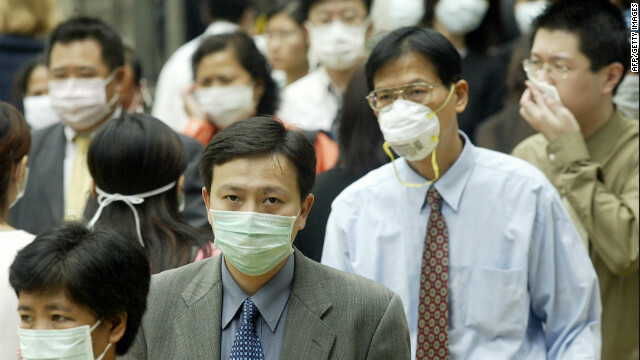 In February 2003, the first case of severe acute respiratory syndrome (SARS) was reported in Asia. The respiratory virus quickly spread to more than two dozen countries in North America, South America, Europe and Asia before being contained. Worldwide, 8,098 people became infected with SARS, of whom 774 died according to World Health Organization (WHO) statistics. Only eight cases were recorded in the U.S., and each person had traveled to another part of the world with widely spread outbreaks of SARS. Today, the CDC continues to monitor SARS activity should the disease once again become prevalent. Influenza-related viruses are just one type of disease that have the potential to become epidemics, both in the U.S. and abroad. The best way to protect yourself from the flu is to get a flu shot. Stay home if you or your family members exhibit any symptoms of illness. Stay current on your vaccinations. Other threats include meningitis, norovirus (stomach flu), whooping cough and tuberculosis. But many scientists and epidemiologists are wary of a reemergence of smallpox, a contagious and sometimes fatal infectious disease for which there is no cure. Smallpox, characterized by raised bumps that appear on the face or body of an infected person, has been eradicated by a worldwide vaccination program. Per the CDC, the last known case of smallpox was recorded in Somalia in 1977, and the last case in the U.S. occurred in 1949. The successful elimination of naturally recurring cases led worldwide health practitioners to stop vaccinating the general public against smallpox. Dr. D.A. Henderson, who led the WHO’s global assault against smallpox, explains. “It only existed in man, not in animals,” says Dr. Henderson. “People who were infected either recovered and became immune or they died. So we just had to stop the spread from human to human. We saw the virus as a chain. If we could just break the links, we could prevent many more cases.” But today’s global political turmoil, particularly following domestic terrorist attacks in 2001, has led many to fear that a bioterrorism plot would resurrect the disease. The CDC reports that the government is taking precautions to deal with a possible smallpox outbreak. Regardless of the nature of the potential disease poised for outbreak, protecting yourself from infection is key to avoiding contracting any illness. Dr. Frieden also recommends staying home if you or your family members exhibit any symptoms of illness, be they from the flu or other diseases. If you are planning any trips abroad, pay attention to global travel advisories. Know which areas pose the largest risks for disease prior to traveling, and follow medical advice if you are going to a high-risk area. For instance, those traveling to Africa—a region where mosquito-borne malaria is extremely prevalent—are often advised to take a series of anti-malarial drugs, as well as use insect repellent. Likewise, those who are traveling via cruise ship have been warned to look out for the symptoms of norovirus, where contamination is difficult to contain. The CDC also advises staying current on your vaccinations. People can avoid or lessen the effects of many diseases that can trigger an epidemic. “Childhood vaccines routinely get well over 90-percent efficacy,” says Dr. Frieden. “Many of the vaccines last longer than a year and cover a wide variety of the subtypes of each disease.” Above all, Dr. Frieden stresses that you should wash your hands. “This simple act can reduce your chance of illness from flu and other diseases transmitted by close contact,” says Frieden. Editors Note: A version of this article first appeared in the 2013 print issue of American Survival Guide.